Electrons are fleeting as they go about their daily duties. The ants in the world of physics, these little guys are constantly on the move. Whether lighting a room, pushing the Tesla to visit grandma, or holding a molecule together, electrons are tireless in their tasks. You can do good by capturing fleeting moments of their work. While you sleep or go about your daily duties the spare time of your computers, tablets and phones can help find the answers to important questions which affect your lives and all the lives around you. 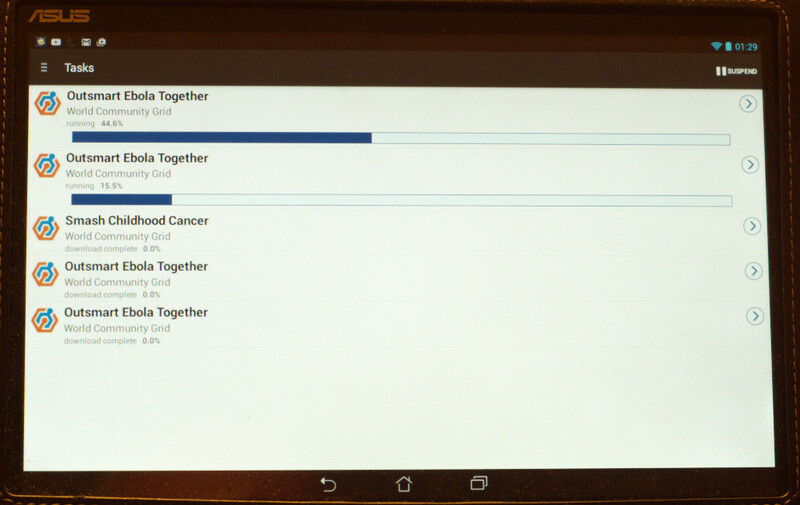 The World Community Grid sponsors projects which use the spare computing time of your devices to find, e.g., cures to childhood cancer or medicines which help fight Ebola. There are other projects you can sign up for with similar good causes. You can read about and sign up for the World Community Grid here. Similar sponsors as the World Community Grid from around the world are also available running many other projects. One of them even searches for intelligent extraterrestrial life. All the projects run under the BOINC app. Information for other sponsors, their projects and BOINC is available here. The BOINC app runs on your Android, Windows, Mac OS X or Linux (Intel) device. I’ve been running this on two of my Android devices, an older tablet and a newer phone for about 3 months now. The app is very aware of battery level, internet connection and processor activity. It can be set to only run when; the battery is over a certain charge percentage and charging, the device is connected to a wired network and when the processors are below 50% activity. Those settings are adjustable to your needs. The app can be suspended at any time also. This post was in response to Evanescent. This entry was posted on 05/31/2017 at 05:26 and is filed under Photos, Politics, Religion, and other lost causes, Wordpress. You can follow any responses to this entry through the RSS 2.0 feed. You can leave a response, or trackback from your own site.